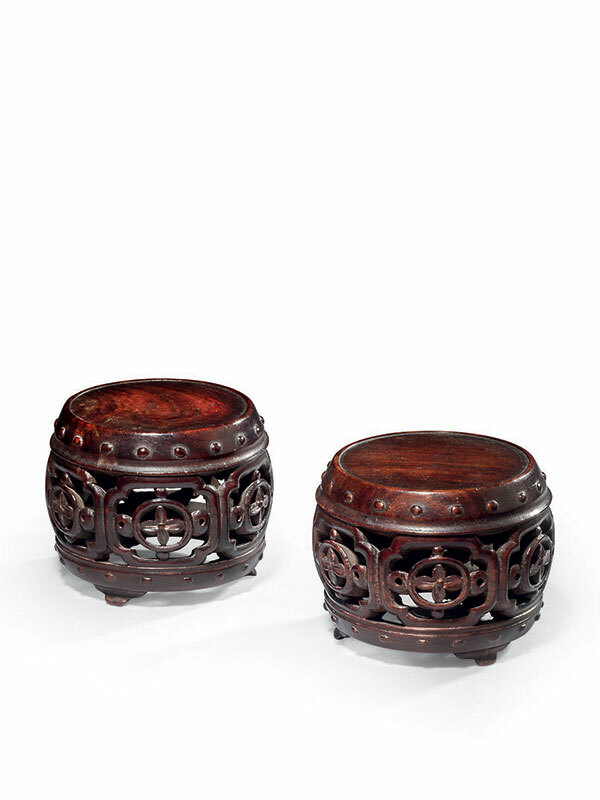 Two miniature hardwood stools of drum shape, each supported on three short splayed feet. The circular top is flat and has a beaded edge. The round body is carved in openwork with six ruyi patterns containing circular and floral motifs. A frieze decorated with continuous bosses encircles the upper and lower borders of the body. The wood is well polished and well patinated. These charming pieces, each carved from a single piece of hardwood, are miniature versions of the barrel-form drum stools known in Chinese as zuodun (literally ‘sitting stool’) or xiudun (‘embroidery stool’). The term xiudun derives from the old practice of covering the seats of stools with embroidered panels both to protect the clothing of the sitter and to enhance the overall appearance. Such practice ceased ultimately, but developed into a tradition of carving designs of fabric panels on the stool bodies, such as the examples here. The bosses or simulated nail-heads on the upper and lower borders are derived from early Chinese drums with skin that were stretched tight and held in place by nails. The form of such drums is very similar to this type of barrel-form stools, whose origin is confirmed by its other name, gudun, or drum stool. There is no evidence for a tradition of making models for patrons to order furniture in China, so miniature pieces such as the present examples were most likely fashioned as ’toys’ for patrons of cabinet makers; they could also be used as stands for precious objects. Apart from the extremely rare Ming and Qing examples of full-scale barrel-form stools, there is no comparable miniature version, to our knowledge. In design, form and proportions, these miniature pieces might have derived from full-scale stools dated to the 17th century of the Ming dynasty: two huanghuali examples are in the collection of the Honolulu Academy of Arts. A further comparable full-scale zitan stool, of more slender shape, is in the collection of the Palace Museum, Beijing. Provenance: the collection of Louise Hawley Stone (1904 – 1997), Toronto, Canada. She was the Royal Ontario Museum’s first volunteer, and was also a major donor, fundraiser, Board member and committee chair.